Continuing just-auto/QUBE's review of interior design and technology trends, we borrowed a Volkswagen Tiguan to take a closer look and got the inside story from Dr Jochen Böhle, head of product development for Volkswagen's compact car line-up. VW claims the second-generation Tiguan is the undisputed best-selling SUV in its class in Europe. Worldwide, VW sold over 2.8m first generation Tiguans in 170 countries and has seen further growth with the second generation. The automaker has said customers like the high seating position combined with a number of safety and comfort features. The Tiguan is now the carmaker's third best-seller in the UK after Golf and Polo. It competes in the compact SUV (or A-SUV) class, and is a rival to the likes of the Toyota RAV4, Nissan Qashqai, Honda HR-V, Ford Kuga and Mazda CX-3. Taken together, it is anticipated that the AO, A, B, C and D SUV segments will make up 28 per cent of the UK car market by 2018. Last June, the popular Tiguan was awarded the top rating of five stars by the independent European consumer protection organisation Euro NCAP. The overall safety rating of five stars is aggregated from the new Tiguan's results in four sub-sections: occupant protection for adults and children, pedestrian protection and driver assistance systems. The VW Tiguan ticks a lot of ADAS boxes. In terms of advanced driver assistance technologies, the Tiguan ticks a lot of boxes. Standard fitment across the range includes Lane Assist, Front Assist, dusk sensor and City Emergency Braking. Other examples of standard safety solutions include the Driver Alert System and adaptive cruise control (ACC). When specified with a DSG gearbox, the ACC becomes a traffic jam assistant that assumes the majority of driving work in stop-and-go traffic. The active bonnet – a first for any Volkswagen - reduces the risk of injury to pedestrians and cyclists. When contact is made with the bumper, a sensor strip triggers a pyrotechnic actuator that lifts the rear edge of the bonnet by around 50 mm in a split second. In the UK, the Tiguan is offered in five trim levels, starting with the S moving up through the SE, SE Navigation, SEL and range-topping R-Line. Our SEL came with 19-inch 'Victoria' alloy wheels, LED headlights with LED daytime running lights and trapezoid exhaust tailpipes. Ambient footwell lighting and a panoramic sunroof added to the pleasure of living with the Tiguan for a week. The model we borrowed came painted Habanero Orange. Although it certainly turned heads when out and about, we wonder if this fiery tone would limit its appeal in the used car market. While our glow-in-the-dark orange compact crossover SUV did not feature it, VW's Trailer Assist including Park Assist is worthy of note as seen on TV. Linked with the rearview camera, this technology helps the driver reverse with a trailer or caravan attached. The optical display visualises actual and possible steering angles in the instrument cluster. Reverse steering is automatic, with direction controlled via the mirror adjustment switch which acts as a joystick, while the driver controls the pedals and keeps a good lookout. The optional feature is available in conjunction with the optional swivelling towbar. The SEL also included Area view with Park Assist that features four separate cameras, located in the rear tailgate, door mirrors and radiator grille that provide a 360-degree view around the car. This means that you can select up to 12 possible views of the vehicle, from the front, rear or side, on either full or split-screen displayed on the infotainment system. Using 'Google Street View', it is possible to integrate 360-degree panoramic images from the street-level perspective on the display screen and use the Google Earth map service to call up a realistic photographic image of the map representation (Google Maps). The VW Tiguan is not short of creature comforts. Tiguans are not short of creature comforts. All come with manual air conditioning, power windows, rain sensing wipers, auto dimming rear view mirror, cruise control and daytime running lights with automatic headlamp beam control. The cockpit is jam-packed with the latest technology set out logically thereby making it easy to find your way around. It includes the carmaker's latest generation infotainment system itself based on the brand's Modular Infotainment Platform (MIB). By virtue of its MQB underpinnings (see below), the Tiguan features a so-called Active Info Display that will be familiar to drivers of Passat and Golf. This replaces the conventional analogue instrument cluster behind the steering wheel. Driver information is supported by a zen-like retractable head-up display (HUD) integrated into top of the dashboard. The HUD info includes driving speed, current speed limit, direction arrows for navigation and indicators for the driver assistance systems. If you are a fan of steering wheel controls (guilty as charged, m'lud), you will love the option offered that allows you to operate the Tiguan's audio system, multifunction display and sat-nav while keeping both hands on the wheel. The front seats used the second-generation Tiguan are 20 percent lighter than the Mk1, thanks to the new design approaches that use novel materials and production methods. In addition, the wires that are woven in a complex pattern in the seat surface help to achieve light springing thereby improving occupant comfort, especially on bumpy roads. The front seats on the SEL were found to be heated while the driver side equipped with a 14-way seat adjustment, massage function. The foam contours of the seats have also been redesigned compared to the previous model. The contours offer better lateral support for passengers and the foam offers a more flexible fit to the body. This five-door, five-seat SUV includes an adjustable 40:20:40 split rear seat bench. When the rear sliding seats are flipped down – by either pulling a loose grip at the corner of either side of the rear bench or using a handy lever found in the boot side walls – this liberates some 1,655 litres of cargo space, 145 litres larger than Tiguan Mk1. The family-friendly rear seat occupant space of the Mk2 has been improved thanks to more headroom and 29 mm of extra knee room. While that doesn't sound like much, two adults can seat quite comfortably in the back separated by a comfy central armrest with two cup holders. Airline style folding tables with pop out cup holders on the back of the front seats make this area a decent place to sit. Rear seat occupants also benefit from three-zone climate control so they can select their preferred temperature. There are plenty of other cubbies dotted around the cabin to store stuff, too. The Tiguan is the first VW SUV to sit on the now familiar MQB, or Modularer Querbaukasten (Modular Transverse Matrix) platform. The MQB extends from the A0 to the B segment. At the Volkswagen brand, for example, it covers Polo, Beetle, Golf, Scirocco, Jetta, Touran, Sharan, Passat and Volkswagen CC. In the future, says the carmaker, all of these models could theoretically be produced on the same assembly line – despite their different wheelbases and track widths. It will also be possible to produce MQB models of different brands together. One of the notable characteristics of the Modular Transverse Matrix is the uniform mounting position of all engines. Two systems integrated into the MQB strategy which plays a key role here are the modular petrol (MOB) and diesel (MDB) engine systems. By introducing these new engine series, the number of engine and gearbox variants offered by the VW Group will be reduced by around 90 per cent, without restricting choice. In addition to standardising conventional internal combustion engines, the MQB also enables an identical mounting position for all current alternative drive concepts without limitations – from natural gas and hybrid versions to pure electric drive. In addition to the Tiguan, Volkswagen's main plant in Wolfsburg, Germany, produces the Golf, Golf Sportsvan, and Touran series. This sprawling site – employing 74,000 workers across an area of more than six square kilometres - has built some 44 million vehicles since production started 72 years ago. Volkswagen India recently began Tiguan assembly at its Aurangabad facility in Maharashtra. The model was first shown locally at the Delhi Auto Expo in 2016 and will go on sale later this year. The India specification Tiguan has a two-litre TDI turbodiesel engine with seven-speed DSG automatic gearbox. Tenneco developed and supplies the continuously controlled electronic suspension system. Out and about, the Tiguan SEL 2.0 TSI was not short of puff despite being fully loaded with passengers, Easter eggs and clutter. It also felt perfectly smooth along potholed and patched up roads thanks to the optional fitment of Tenneco's continuously controlled electronic suspension system (Dynamic Chassis Control, in VW parlance). 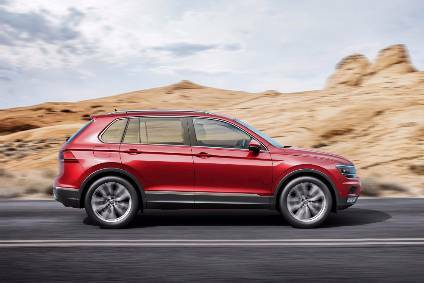 VW used the most recent Geneva motor show to extend its Tiguan model range by unveiling the Allspace, showing the model in an optional seven-seat version. With a 109 mm longer wheelbase and 215 mm longer exterior length, the new model version offers more space for luggage and passengers. The Allspace has more standard features than the previous Tiguan. For example, its Trendline base version has additional features such as roof rails (in black), the Composition Colour media system with Connectivity Package (phone and USB interfaces), a multifunction steering wheel, trapezoidal tailpipe trims, LED daytime running lights and a variable cargo floor.Trendline base version has additional features such as roof rails (in black), the Composition Colour media system with Connectivity Package (phone and USB interfaces), a multifunction steering wheel, trapezoidal tailpipe trims, LED daytime running lights and a variable cargo floor. The performance range of the Tiguan Allspace starts at 110 kW / 150 PS and reaches 176 kW / 240 PS. Along the same lines as the classic Tiguan, the new Tiguan Allspace is also launching with front-wheel and all-wheel drive. The front-wheel drive versions of the SUV can manage large trailer loads of up to 2,200 kg depending on the engine version; in the all-wheel drive Tiguan Allspace this figure increases up to 2,500 kg. The new SUV will launch in Europe beginning in September 2017. To find out more about the new VW Tiguan Allspace interior design and technology, we spoke to Dr Jochen Böhle, head of product development for Volkswagen's compact car line-up. How does the interior of the standard Tiguan and Allspace compare? The VW Tiguan Allspace is even better equipped. The Allspace is even better equipped. For instance, the Allspace features a remote release for the second-row seat backrests as standard. I guess when designing the next generation model, there is always a balance to be struck in terms of how much is carried over from the previous generation and how much innovation is added. How did you address that with the interior of the Tiguan? The main point is that the customer must recognise that it is a Tiguan, distinguished by features such as the small overhangs at the front and rear and LED front lights. Were there any challenges between combining interior styling of the Tiguan with interior engineering design? We did a lot of evaluation based on our customer needs. For instance, we found a lot of Tiguan customers would like a little more space. So we deliberated whether to enlarge the trunk or add two more seats in the back of the car. We found different solutions for different markets. For example, the Tiguan Allspace is going to China and the North America market but, only in Europe do we sell both the standard Tiguan and Tiguan Allspace. That's where we found a customer need for both types of car. The standard Tiguan is very successful, especially in cities due to its compact dimensions. There is another group of customers who said that they wanted more space for their hobbies and cycles, etc. so we designed a car that met our customers' needs. Compared to the standard Tiguan, the Allspace is 21 centimetres longer making it 4.70 metres overall. So we have moved the Allspace to the outer edge of the compact class, closing the gap between standard Tiguan and Touareg. When exploring ways in which to add more interior space to the Allspace – aside from physically extending the length of the vehicle body – did you consider thinner seats? Not really. We found that the levels of comfort must be the equivalent to the standard Tiguan. Given that our customers recognise the Tiguan as a premium SUV, making thinner seat backrests were not an option. Quality, of course, remains an important aspect of both the standard Tiguan and Allspace. Customers must be able to see, touch and experience the quality. The use of organic materials in car interiors has been talked about for some time. Is that something VW is exploring? We are working on [organic materials] for car interiors. Yes. We are working on it but it is not yet ready for series production. A lot of effort was spent of measures to reduce the vehicle weight of the Allspace. Was carbon fibre a consideration? It was not an option for the development of the Allspace. For future Volkswagen cars, there are concepts with carbon fibre and similar. Could you give us your vision of what a VW autonomous car could look and feel like? We have the first prototypes of autonomous driving cars which are preparing for testing shortly. If you look at the current list of driver assistance features in the current Tiguan, you can imagine that many will still feature in the autonomous car. For example, ACC and Lane Assist. To build a couple of prototypes is relatively easy, but to make them safe and secure will take years. We understand that individualisation is a growth market that offers great potential for differentiation. 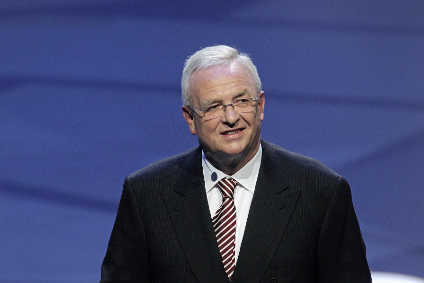 How is VW responding to that? We are developing an ecosystem which offers mobility services with a central User ID for the customer. It will recognise you, as the driver, regardless of which car you enter. It will automatically adjust the ambient temperature and seats to suit your preferences. As you enter the car, your name will appear on a welcome screen and your telephone numbers stored in your smartphone come over the Cloud direct to the car. What other megatrends in the automotive interiors industry do you see and how could that shape the look and feel of tomorrow's VW cabin? Connectivity will dominate the next generation of cars. Connectivity will dominate the next generation of cars. While the exterior design will still be a major reason to buy a car, its performance will be less interesting in future. The new, younger generation customers are more interested in connectivity and easy to handle and use features. They want to be able to talk to their car. We are working on studies for that but it is still at the very early stages. It will take another couple of years.